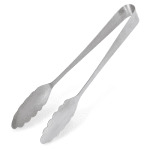 The Carlisle 607683 serving tongs are constructed of a durable stainless steel that resists bending. Scalloped edges on the bowls help users scoop up product. Its polished finish creates a bright look over the single-piece exterior. This utensil can be cleaned in the dishmachine.